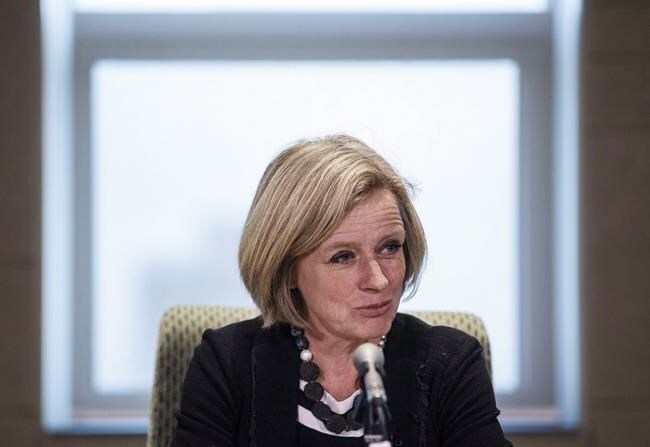 EDMONTON — Alberta Premier Rachel Notley says she wants progress within days from Ottawa in resolving a pipeline dispute with British Columbia, or her government will look at further retaliatory measures. Notley, who has already suspended talks to buy B.C. electricity and has banned B.C. wines from Alberta, reiterated Monday that B.C. 's actions on the Trans Mountain pipeline are illegal and must be reversed. "We do not seek an escalation, but if B.C. continues to insist that they have rights to attack Alberta's economy that they don't have, we will have no choice (but) to respond," said Notley. "It's in British Columbia's power to put this issue to rest." Two weeks ago, B.C. Premier John Horgan's government announced it was looking at restricting expanded flows of oil into the province pending a review to make sure that such spills could be properly cleaned up. The move would have a direct impact on the Trans Mountain pipeline expansion, which was OK'd in 2016 by the federal government but has faced delays and opposition in B.C. ever since. Horgan says the restriction is in keeping with the province's responsibility to keep its coastline and waterways safe. But Notley said it's clear constitutionally that Ottawa has the final say on interprovincial projects like pipelines. She said Horgan and his government can follow the law, "or they can dig in their heels and pretend they are a separate country with powers to make whatever laws they want with no regard for the Constitution or the views and rights of other Canadians." Prime Minister Justin Trudeau's government has been meeting with B.C. counterparts in recent days to resolve the impasse. Notley has announced she has suspended talks with B.C. to buy $500 million worth of electricity and has halted imports of B.C. wine, worth about $70 million a year. She has also struck a task force to look at other ways to respond to incursions from B.C., and from any other jurisdiction, on its core industry. Notley said she will give the feds a little more time to resolve the issue, but not too much. Notley said she hasn't ruled out more extreme options such as finding ways to restrict oil to B.C. or refusing to transport gas from that province, but said she doesn't want to harm Alberta's interests in the process. "You cut off shipments to B.C, it's Alberta's economy that feels that more than B.C. 's," she said. Kinder Morgan Canada has approval to triple capacity on the existing Trans Mountain line, from Edmonton to Burnaby. It's a critical lifeline for Alberta's, and Canada's, oil industry as it seeks better prices globally for its product and offsets steep discounts due to tight pipeline capacity on the North American grid. Trudeau's government has said the project will proceed. Alberta United Conservative Opposition leader Jason Kenney has urged Notley to reconvene the legislature for an emergency debate on the issue. "I think that what we need to do is not be talking to each other inside this building, but rather speaking to people across this country about the import of our position, and so that's what we're going to do." She said on Tuesday her government will roll out an online campaign "so that Albertans and Canadians who want to voice their support for a strong economy and a strong environment can do so to the B.C. and Canadian governments."